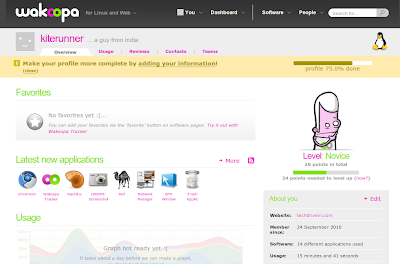 Wakoopa is an online service which has a local tracker client specifically for Windows, Mac and Linux users. It tracks your usage of different applications and gives you a detailed picture of how you used it, your most used apps etc. And based on your usage patterns, Wakoopa even recommends new applications you might want to check out. Above screenshot shows the usage pattern generated by Wakoopa, based on the different apps I used in my Ubuntu desktop for the last couple of hours. 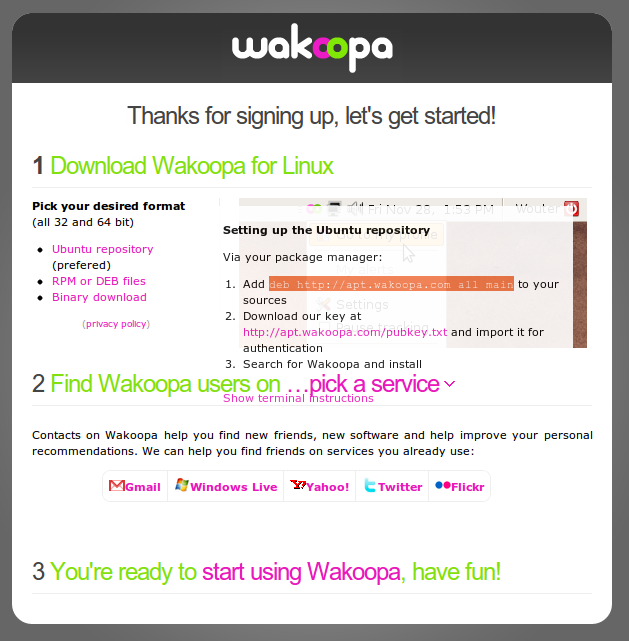 Wakoopa is quite easy to install and use and there is a version available for Windows, Mac and Linux users. Wakoopa is similar to Rescuetime application for Windows and Mac users. 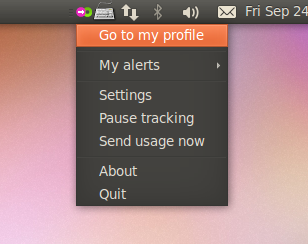 How to install Wakoopa tracker client in Ubuntu? 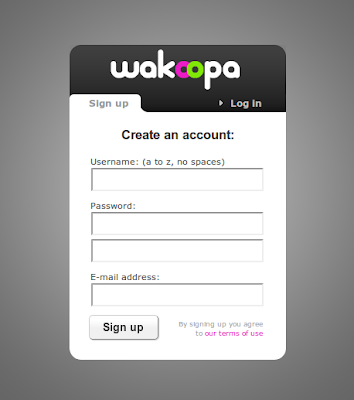 Goto www.wakoopa.com and sign up with the service. Enter your preferred username and other details. Now you will be asked to install Wakoopa client tracker in your desktop. Remember, there is a .rpm and .deb version of Wakoopa available. 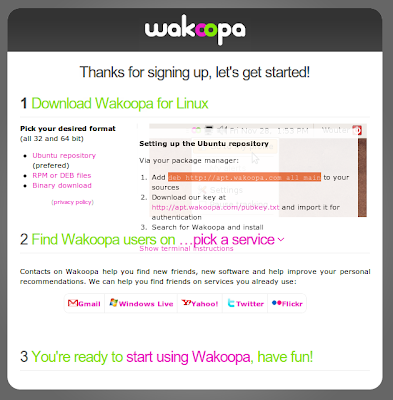 But here we will concentrate on installing Wakoopa on Ubuntu via Wakoopa repository only. Now do the following in Terminal to add Wakoopa repository and GPG key and lastly to install Wakoopa client in Ubuntu. sudo sh -c "echo deb http://apt.wakoopa.com all main > /etc/apt/sources.list.d/wakoopa.list"
Done. Now launch Wakoopa from Applications - Accessories - Wakoopa. 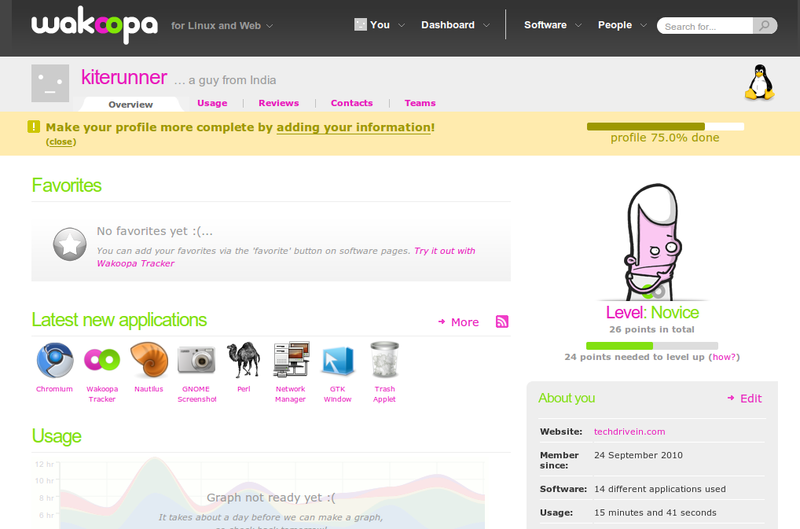 Now use your Ubuntu as you like and check out your new Wakoopa profile to get a detailed usage statistics of different applications. Have fun.